U.S. Commercial Water Heater Industry « Global Market Insights, Inc. In an era encumbered with unpredictable weather conditions, the U.S. commercial water heater market has managed to chart out a lucrative growth map for itself, driven by the escalating product demand across freezing zones. These water heaters indeed, account for one of the topmost energy expenses in the commercial sector. These technologies also find use in cooling and dehumidification applications and possess the potential to minimize energy consumption, that has essentially been the mantra for energy companies and government bodies across the United States. One of the primary factors that’s driving the U.S commercial water heaters market is the collective adoption of renewable energies by several industries across the nation. The country’s latest push toward a 100% renewable future ‘Green New Deal’ also urges the government led efforts to focus more on the causes of climate change and to fund projects that will help communities fight its damaging effects. If the deal happens to pass, its successful implementation would call for the deployment of cleaner energy technologies, investments in energy innovations and access to low carbon energy technologies. Robust sustainable energy deployment aside, the U.S. commercial water heater market has received rapid momentum from the massive expansion of manufacturing facilities in the region, given the extensive product installation across such units. With the U.S. service industry depicting substantial growth by the day, the number of manufacturing and production facilities in the country is only bound to escalate, which would prove rather beneficial for augmenting the U.S. commercial water heater market trends. Citing an instance validating the aforementioned fact, Chemesis International Inc., recently declared that it plans to add an extra 25,000 square feet of manufacturing in Cathedral City, California, which the company aims to complete by Q2 2019. 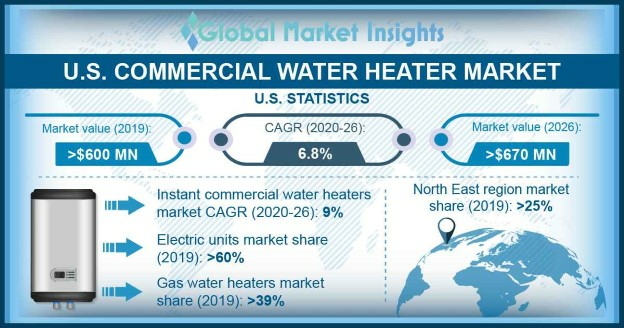 The expansion is likely to demand the installation of several water heaters for industrial purposes, that would majorly contribute toward the growth of the U.S. commercial water heater industry. Speaking of the regional landscape, it is pivotal to mention that the U.S. commercial water heater market will receive commendable traction from the East North Central zone comprising states such as Indiana, Ohio, Illinois, Wisconsin, and Michigan. This may be majorly attributed to the efforts of the regional government aiming to upscale the businesses across these zones, alongside the expansion of the existing businesses, specifically in the state of Michigan. Citing an instance of how even companies have been striving to upsurge the potential of the regional commercial water heater market, Fiat Chrysler recently made it to the headlines for having announced that it plans to undertake a major manufacturing expansion in Detroit, converting the Mack Avenue Engine factory to an assembly plant for a new Jeep SUV and the next-gen Jeep Grand Cherokee. The plan, a part of a manufacturing expansion in southeast Michigan worth USD 4.5 billion, aims to add production at five factories in Detroit and nearly 6,500 new jobs. The expansion would generate substantial jobs and pave the way ahead for the installation of water heaters, thereby driving U.S. commercial water heater market from the North East Central zone. According to the ENERGY STAR summary (water heater programs), 2018, the state of Illinois was known to have registered the maximum budget for water heater programs across the region – estimated to more than USD 10 million to USD 25 million. That said, the support from municipal utilities as well as small-scale cooperatives will also serve to impel U.S. commercial water heater industry share from the North east Central region. Armed with a fierce competitive spectrum, spanning companies such as Haier Electronics, Rheem Manufacturing, Bradford White, Rinnai Corporation, Havells India Limited, General Electric Appliances, Bosch Thermotechnology, and A.O Smith, the U.S. commercial water heater market is all set for a major upheaval in the years ahead. As per estimates, the U.S. commercial water heater industry size is likely to surpass USD 750M by the year 2025. This entry was posted in ENERGY, MINING, OIL AND GAS and tagged U.S. Commercial Water Heater Industry, U.S. Commercial Water Heater Market, U.S. Commercial Water Heater Market Analysis, U.S. Commercial Water Heater Market Growth, U.S. Commercial Water Heater Market Outlook, U.S. Commercial Water Heater Market Pdf, U.S. Commercial Water Heater Market Price, U.S. Commercial Water Heater Market Report, U.S. Commercial Water Heater Market Share, U.S. Commercial Water Heater Market Size, U.S. Commercial Water Heater Market Trends.